Curiouser and Curiouser...: Last chance for 10% off at ASOS! I saw this amazing print and I was SOLD. Anything with Baroque print is fine by me. I'll be wearing this with my black blazer or layering to transform it into a mini skirt or to create a contrast sleeves look. It's just such a versatile piece - the possibilities are endless. I don't usually go for swing / smock dresses so fingers crossed this isn't a tent! Jeans wise, I usually go for normal blue denim or black. One of my best friends says I have colour issues. Apparently I need to step away from black and invest in some actual colour. I thought these jeans were a good start to introducing colour into my wardrobe. 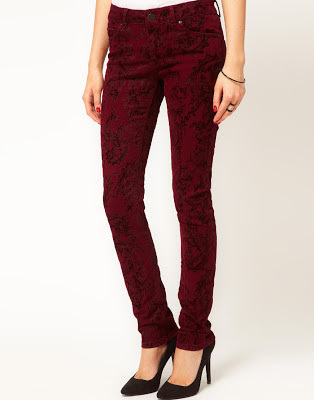 The flocked pattern is really interesting and reminds me of the trousers Zara sells - but at a fraction of the price. These beauts were already on sale but with an extra 10% off, I didn't think twice. I live in thigh highs so thought it was worth investing in a couple more pairs! 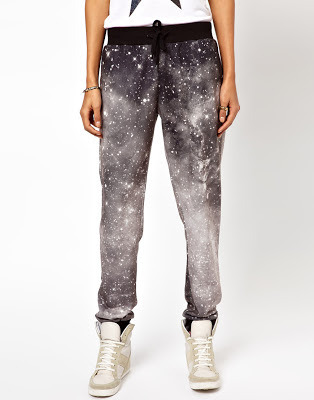 Right now you're thinking: Lucy, why on earth did you order joggers?! I'm still a little baffled as to why. But I think it was the print that sold me. I'm not too keen on the waist band / draw string area so I'll cover these with an over-sized tee. Really want to get some Nike Liberty X hi-tops to tuck these bad boys into. It's sports luxe, dah-ling. Remember that time where everyone had or wanted a thick arran knit cream cardigan? I think stores like New Look did them in other colours too. I liked them, but couldn't jump on that bandwagon as I'm pale and cream / white washes me out. I love grey. I love salt and pepper speckle knits. So this ASOS cardigan was love in knitted form. I saw these heels featured in More magazine recently and I loved the elegance of the ankle strap paired with the edginess of the stud detailing. I can't wait for the weather to warm up so I can wear these with bare legs! To get in on the action use the discount code: VALENTINE10 for 10% off at ASOS. i love your picks!!!! especially those studded strappy heels omgosh those are so cute!! Awesome picks, I love the Galaxy trousers and the boyfriend cardy, it's looks so comfy! Wow that is a serious haul, good job! I've trained myself to ignore ASOS discounts now because I really can't control myself haha.